Will the Right Heirs Inherit Your Estate? As emotionally unsettling as your death would be to your spouse, children and extended family, its impact would have additional ramifications should you die without having drawn up a will. Whether young or old, fit or infirm, having a valid will or other binding declaration ensures that the assets you accumulated over a lifetime will be distributed as you would prefer. Perhaps you’ve always intended to bequeath the country cabin to your two sons with whom you bonded during years of hunting and fishing. Maybe you’ve promised your only daughter that piece of bucolic land to use as she wishes. And that brother forever down on his luck, well, you assured him you’d take care of him financially even after you’re gone. None of those plans are guaranteed to proceed as you had verbally pledged without being codified in a will. Despite intentions to apportion your assets accordingly, if you fail to create a will, the Commonwealth of Pennsylvania shall essentially, prepare one for you based on the law of intestate succession. The law of intestate succession in Pennsylvania regulates which heirs, and in what order, receive what, if any, portion of the decedent’s assets. The law is designed to protect both the surviving spouse and children, if any, and may also provide for parents, siblings and other relatives. It is also designed to distribute the decedent’s wealth in a manner that closely represents how the average person would have drawn up their estate plan in a will. A common misconception is that, upon your death without having a will, the Commonwealth will inherit your assets. In such a scenario, your estate becomes governed by intestacy law, a set of state laws that dictate the allocation of a decedent’s estate. The distribution scheme in the intestacy statute is absolute and may not be executed in accordance with your intentions, underscoring the importance of having a will. Surviving spouse, no children or parents: If no children or parents are survivors, 100 percent of the intestate estate is directed to the surviving spouse. Spouse and a parent(s) surviving, no children: If the decedent is survived by his or her spouse and one or both parents, the surviving spouse is entitled to the first $30,000 of the estate, plus one-half of the remaining estate. Surviving spouse and children: If the children are also the surviving spouse’s children, the spouse will receive the first $30,000 of the estate, plus one-half of the remaining estate. However, if at least one of the surviving children is not also the surviving spouse’s child, the spouse is limited to one-half of the intestate estate, with the assumption being the spouse will care for their own children, but not necessarily those of the decedent. Surviving children, no spouse: The children receive the entire net estate. No spouse or children; decedent’s parents survive: The decedent’s parents share the estate 50-50. If only one parent survives, that person inherits the entire estate. No spouse, children or decedent’s parents surviving: In this case, the estate will be distributed among the decedent’s siblings and their children. No spouse, children, decedent’s parents, siblings, nieces and nephews: The maternal and paternal grandparents of the decedent will share the estate equally, and their children. No spouse, children, decedent’s parents, siblings, nieces and nephews, or grandparents: Aunts, uncles, their children and grandchildren share the estate. No survivors: The entire net estate goes to the Commonwealth. However, situations beyond financial may exist and need to be considered if a person dies without a will. For example, should a person die without having a spouse, but has minor children, a decision on guardianship will be made by a judge, who will also determine who will handle the estate inherited by those children. Addressing such a situation in a will ensures that your children’s future plans will set by you and not a judge. 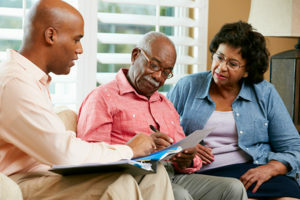 Other reasons to have a will include accelerating what can be a lengthy, expensive probate process; minimizing estate taxes; retaining the option of making gifts or donations to charities or foundations; and having the ability to disinherit those who otherwise would stand to inherit a percentage of your estate. Having a will gives a person control over the distribution of their assets upon their death. At Raffaele Puppio, our estate attorneys possess the knowledge, experience and reputation to draft a will that satisfies the wishes of our clients. The firm was founded on a rich tradition of public service and professional excellence. For information regarding wills and other legal matters, contact us at (610) 891-6710 or info@raffaelepuppio.com, or visit our website at www.raffaelepuppio.com. Comments Off on Will the Right Heirs Inherit Your Estate?